Me and all our jeans. I am the fortunate mother of a 29 week preemie. She was born weighing 2 pounds and 6 ounces. She spent the first 60 days of her life, critically ill in the Neonatal Intensive Care Unit. The incubator that she spent all of her time in was donated by the March of Dimes and we truly believe that our lives would be very different if it weren’t for the March of Dimes and the special Nurses and Doctors that cared for her. Now she is a BIG SISTER! Her little brother was born at 36 weeks weighing 6lbs 3 oz. During my pregnancy I had to take a medication that the March of Dimes has been researching and studying for years. They also work with insurance companies to push for approval of the medication in order to prevent prematurity. We know for a fact that this medication is the reason that I was able to carry him as long as I did. She is now 5 years old and a typical healthy, happy, and silly little girl. She is the BEST big sister ever! Our prayers have been answered and now it is our job to give back in hopes of saving other babies and helping other families. It was all of your thoughts and prayers that got us here and that will NEVER be forgotten.Thank you for helping us reach our goal. Last year we raised $14,000 and this year our goal is $15,000. Our friends support the cause! What more can we ask for? Thanks Betsey! 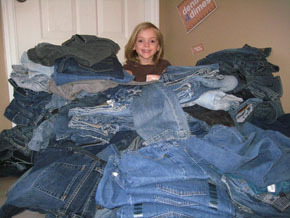 Denim 4 Dimes Event has been scheduled for 4/27! CBS features Denim 4 Dimes!